Some 100 million American workers are affected by computer eyestrain, a symptom of Computer Vision Syndrome. 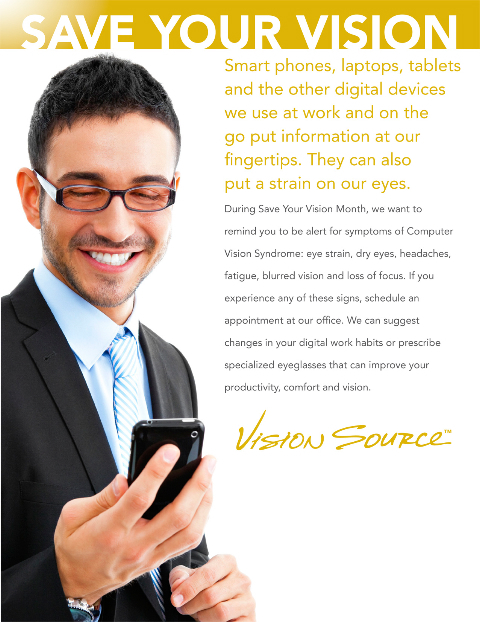 March is Eye Safety in the Workplace month, and as our nation has moved from a manufacturing society to an information society, Computer Vision Syndrome has become a workplace concern. While prolonged computer use will not damage vision, it can make you uncomfortable and decrease productivity. CVS can be partially alleviated by changes in the ergonomics of the work area. Proper lighting and monitor placement can go a long way toward reducing CVS, as can giving your eyes frequent “breaks” from the computer. But the underlying cause of CVS – the ability of the eyes to focus on the computer screen – may only be remedied by specialized computer glasses.